Smile Perfection with Teeth Whitening from Your Dentist in Las Cruces! When you meet new people, at least a third of them will notice the condition of your teeth before anything else. If you have smile flaws like stains and discoloration, you risk making a poor first impression, and you will lack the confidence that you need. Thankfully, there is a remedy – teeth whitening from your dentist in Las Cruces. As you read on, you’ll learn how the process works and the different treatment options available from your cosmetic dentist. Zoom! Into a New Smile! Patients are able to see phenomenal results in the appearance of their smiles using the Zoom! whitening method. It incorporates a high-powered gel and a completely custom application to lift troublesome stains from your teeth. Protection – The first steps taken are to secure your soft tissues. A staff member will insert a barrier that will cover your gums, tongue and cheek. Thus, only your teeth will be exposed to the treatment process. Application – The next step is to apply the whitening gel to the surface of your teeth. Light Exposure – The properties in the gel are then activated by your dentist shining a special light on your teeth. Each round of treatment lasts 15 minutes and will be completed three times. Touch-ups – In around an hour, you’ll have teeth that are up to eight times brighter than they previously were. Your dentist will then equip you with a take-home kit for touch-ups so you can maintain your beautiful new smile. For patients who desire to treat their stains and discoloration in a more convenient manner, your dentist provides a take-home whitening kit. Unlike the store-bought alternatives, it still uses professional strength whitening agents and trays custom-designed to fit your mouth. Thus, you won’t have to worry about gum irritation. The take-home process is simple – patients wear the custom trays filled with the whitening gel for 20 – 30 minutes each night. Typically, the procedure takes one to two weeks to complete. After your teeth are whitened, you want to maintain your new look, so it’s best to limit your consumption of foods and drinks that are highly pigmented like coffee, tea, wine, dark berries and tomato paste. If you choose to indulge in any of the above, then be sure to brush and floss your teeth immediately afterwards. It’s also helpful to keep some mouthwash on hand for times when you’re out and about and can’t perform your normal oral hygiene routine. 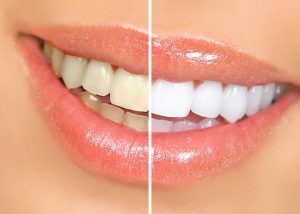 You want to smile with confidence, and teeth whitening in Las Cruces can make it happen. Just reach out to your cosmetic dentist to schedule a consultation, and you’ll be on your way to smile perfection! Dr. Ramon M. Ortiz is a passionate dentist who plays an active role in improving oral health and advancing the field of dentistry. He understands the importance of having a smile that you can feel good about, which is why he helps patients brighten theirs with teeth whitening. To get the smile of your dreams, you can find Dr. Ortiz at Painted Skies Dental Center, and he can be reached for more information through his website. Comments Off on Smile Perfection with Teeth Whitening from Your Dentist in Las Cruces!